Two-thousand-year-old savior also sick of receiving myrrh as birthday gift. 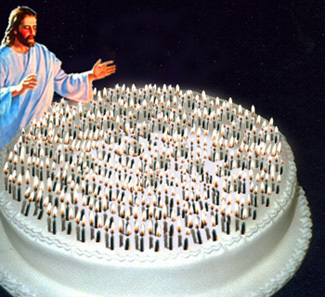 He huffed and He puffed, but Jesus was no match for the 2,012 candles flickering atop His birthday cake this year, according to reports from Heaven. "I guess it was inevitable," one angel said. "Jesus is both fully human and fully divine, and the human side is slowing down with age." Several archangels said they hoped the incident would spur Heaven to scale back on its annual Nativity party, a frequent source of consternation for residents of Paradise. "Have you ever tried throwing a surprise party for an ominiscient being?" one saint said. Others grumbled about the difficulty of shopping for Jesus. "What are you supposed to get a guy who created the universe? A new necktie?" To play it safe, many afterlife souls have followed the biblical tradition of presenting Jesus with gift cards for myrrh on His birthday. But the Lord asked them to stop in 2006, saying he had enough aromatic gum resin to last several eternities.